Drip, drip, drip… slowly, but surely the floor of my utility room was filling with water. Obviously it was the pressure tank, so I waited out the weekend and called the HVAC company that recently serviced my furnace. That was mistake #2, as I was calling the wrong company. Another company had put in the pressure tank a few years prior and had made mistake #1 that would have saved everyone involved some hassles, time and money – they had a crappy sticker. They forgot to claim the real estate. They forgot to properly sign their work and become the obvious go-to source if there was a problem. One low-cost sticker applied in 3 seconds could have prevented me calling the wrong company and paying for a service call and perhaps a new pressure tank that I didn’t need. As it turned out the pressure tank was under warranty and while it was being replaced it was discovered the pressure tank was fine, there was just a crack in one of the parts. Lesson learned… by me. But, I’m sure there are thousands of plumbers, electricians, heating specialists, equipment dealers, etc. still making this simple mistake. I wonder how much business they are losing by saving a few cents having a nondescript, cheap sticker – or no sticker at all? So, here are a few tips for HVAC service companies regarding stickers. Be bold and obvious. Basements and closets are dark and home owners probably aren’t wearing reading glasses. A cheap paper label with generic type or hand written service info, applied on the backside of equipment is not going to cut it. This is a calling card for the homeowner, your (hopefully) repeat customer – don’t hide it. Be helpful and professional. “What To Do If Your Furnace Fails To Work” (or tank leaks, or fuse blows, or water pressure changes, etc.) is helpful information for the home owner that reinforces you as the experts that care and guarantees the sticker (and your name) stays prominently stuck. Leave your unique mark. Sign your work and make it super easy for home owners to find you when they need you. 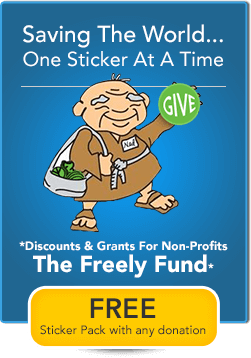 Use your logo… your slogan… your discount coupon – give them every obvious option to stick with you. Buying cheap, generic labels out of catalog not only pigeon holes you as a cheap and generic company but may leave you unnoticed and out some business. And if you don’t properly mark equipment or offer enough helpful information, the next service guy or a savvy marketer might. 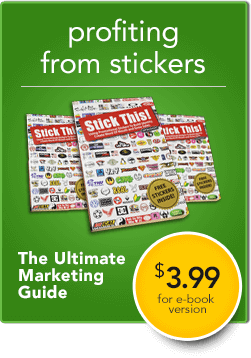 Check out this story about a water heater company in California that delivered over a million stickers with instructions to place the sticker over past stickers. Ethically questionable but it does point to the power of the stickers and information to homeowners. 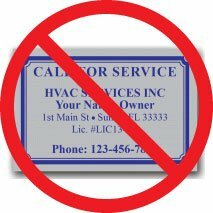 Of course, this isn’t just about HVAC companies, any service company that can be “claiming real estate” and leaving their unique mark and calling card should be utilizing a well designed sticker. 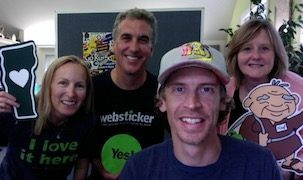 At Websticker we specialize in designing and producing custom stickers that best fit a company’s identity and marketing program. 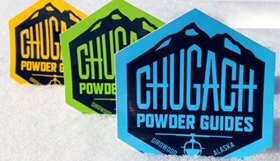 Yes, they may cost a few cents more than a generic label, but the slightly higher price will easily be offset with a more professional look that fits your unique identity and keeps you better connected to your customers.